As highlighted in our VA loan overview, the VA Home Loan program has several benefits. 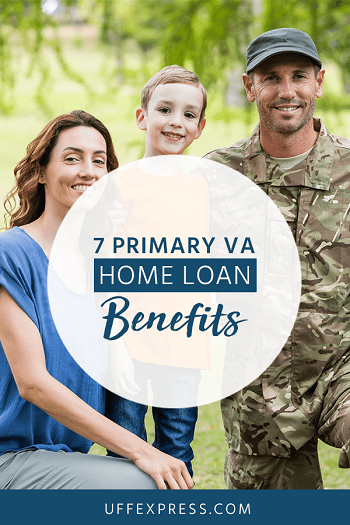 With all factors considered, the VA home loan is likely the top overall program in the nation and offers better rates, lower payments and more flexible guidelines than most other loan programs. There are 7 primary benefits that every eligible VA borrower must be aware of. This is not only the most common reason Veterans utilize their VA loan benefit, but it is also the top benefit that the VA Home Loan offers. Most loan programs require at least 3% of the purchase price as a down payment. On a $250,000 home, the typical loan program would require $8,000-$10,000 down, so the VA home loan benefit can save you thousands of dollars out of pocket. Saving for a down payment is a long process, and often the reason people wait to buy a home. By using a VA loan, you can eliminate one of the largest hurdles in purchasing a home. Meaning you can buy immediately rather than spending years to save. A lower credit score, bankruptcy or foreclosure does not disqualify you from a VA home loan. The VA does not have a minimum credit score requirement and has the shortest waiting periods after a significant credit issue (like a foreclosure or bankruptcy). VA loan guidelines are very flexible on student loan requirements as well. If your student loans are deferred more than 12 months past the closing date on your mortgage, a lender can ignore any projected student loan payment. No other loan program offers this benefit, as all others require to count a payment against the borrower’s debt-to-income ratio (even if the student loan is deferred). Commonly known as “PMI” or Private Mortgage Insurance, mortgage insurance is added to your monthly payment on almost all other loan products. The VA however does not require such insurance premiums. Not having monthly mortgage insurance is a tremendous benefit to the VA home loan. PMI premiums are generally $150 per month on a $250,000 home. By not having mortgage insurance, not only does it help reduce your mortgage payment, but since your payment is lower this benefit also allows you to qualify for a more expensive house (as you can allocate more of your monthly payment to how much you’re borrowing instead of wasting money on unnecessary mortgage insurance). VA loan rates are generally .250-.500% lower than those of conventional loans. Several factors determine your interest rate, but since the VA home loan is partially secured by the government, it means they’re lower risk for lenders and therefore more desirable. This is a significant benefit that will not only allow you to save money in the short-term, but this will also help you save thousands of dollars over the life of the loan. You can use your VA home loan benefit as many times as you’d like! According to the National Association of Realtors, homeowners stay in their home around 9-10 years. So odds are you’re going to buy 3-4 properties over your lifetime. Once you’ve sold your home and paid off the prior loan in full, your VA entitlement is restored, freeing it up to be used on another purchase for a primary home. Just as you can use your VA home loan benefit multiple times it also NEVER expires. Even if you served in the military 30, 40, or even 50 years ago, you can still use your benefit. VA home loans can be utilized to purchase OR refinance your home. Whether you have a VA loan on your home or not, you can utilize your VA Home loan benefit with a VA cash-out refinance. The VA allows 100% financing on refinances as well, and therefore you can utilize your VA benefits to turn your home’s equity into cash. For example. If you owe 100,000 on your mortgage and your home is worth $150,000, then you can borrower up to 100% of the appraised value of your home. Meaning you would net the difference of the value ($150,000) and the amount you owe ($100,000), therefore freeing up $50,000. The proceeds of this refinance can be used for nearly anything. Make home improvements, pay college tuition bills, buy a new car or reduce or eliminate high interest credit card debt. For most military borrowers, VA loans represent the most powerful lending program on the market. The list above is some of the most common benefits and are things you should consider when financing a home. Between saving thousands of dollars out of pocket by eliminating your down payment, to saving hundreds of dollars a month due to a lower interest rate and no mortgage insurance, the VA home loan benefits are better than any program out there.